The Gopher is a Popup Counter sets up in less than 10 seconds! The hydraulic shocks expand and collapse frame with a simple pull and push of your hands. The counter top can support up to 42 lbs. 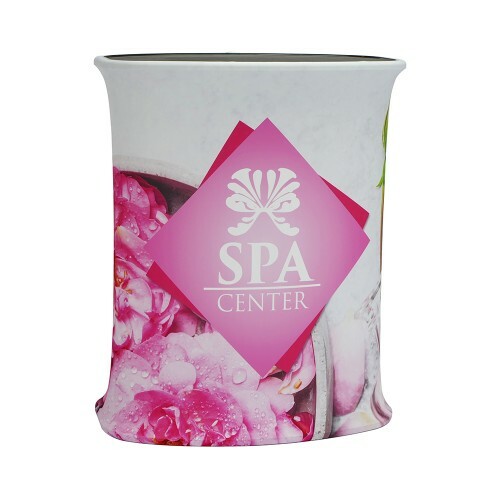 The graphic wrap is custom printed with dye sublimated on stretch fabric. Graphics can be easily swapped out with a new graphic as needed. Portable Popup Counter Display with Custom Printed Graphics and Carry Bag This portable Popup Bar Mi..
Spot Light Trade Show Light Lumina 6 Power SpotIllumination is a very important piece of the puzzle.. Embrace 21ft Wide x 15ft Tall Quad Stacking Push-Fit Tension Fabric DisplayThis booth is wide and ta..